KBS historical drama “Hwang Jin-I,” starring talented Ha Ji-won, is winning over Japanese viewers, posting the highest rating in its timeslot. Japanese TV station NHK started airing the visually stunning drama on its satellite channel bs2 at nine o’clock on Sundays since last April. After recording the highest rating in! that timeslot, “Hwang Jin-I” was aired on NHK every Saturday night since last October. Ha Ji-won’s representative says that, although historical dramas are difficult for Japanese fans to understand, Ha’s superb dancing performances and colorful traditional Korean costume have captivated Japanese women. Ha is already well-known in Japan for her role in “Memories of Bali.” The popularity of “Hwang Jin-I” has driven her Japanese fans to ask Ha to Japan. Meanwhile, the actress is getting ready to shoot a new film, “My Love by My Side,” in early February. Do-Young, 33-year-old top anchor woman in Korea, apparently seems to be the perfect role model for every girl in passion. She has got it all, from educational background, prosperous family, beautiful feature, natural-born talent and even adorable personality. Do-Young shines anywhere and everywhere, but deep down in her heart, she suffers from extreme loneliness and cold. Originally, Do-young was abandoned in front of a orphanage when she was a very little girl. By chance, she was adopted to a rich professor family without any kid and lead her princess life. Several years later, when the step parents got their unexpected biological daughter, Do-young felt threatened that she might lose her parents’ love and affection. So, 13- year- old Do-young abandoned her 5-year-old little sister in front of the Seoul Central Train Station and took her parental love back. 20 years later, Do-young met a charming personal shopper, Sawol, in VIP corner of a luxurious department store. By her merry and cheerful characteristics, Sawol chooses fashion item for Do-young and they starts to feel friendly each other. By the malicious purpose of Do-young’s orphanage friend, Do-Young’s terrible deed is disclosed and Sawol turns out to be the very sister that Do-young has abandoned. depicts two sisters and their love, desire, revenge, and forgiveness. Actor Lee Min-ho: "Past trials led me to drama role"
Main lead of the KBS 2TV drama "Boys over Flowers"
The latest heartthrob for Korean women is the young actor Lee Min-ho, the hero of the new hit KBS 2TV drama (airing Mon-Tues) "Boys over Flowers." His casting as the hero of this drama series, extremely popular across Asia, created a buzz from the start. Any handsome actor would covet the role of one of the members of the "F4," a group of rich and popular boys at a school where the story takes place. The Korean cast for F4 was finally revealed and the casting of a complete novice actor, Lee (22), for the role of F4 leader "Gu Jun-pyo" was almost shocking. The series has kicked off and Lee has literally become a star overnight, silencing doubts of how he would handle the heavyweight role. His name tops various Internet search-word lists and 100,000 fans visit his Internet homepage each day. The "F4 craze" has hit Korea since the drama series was also made in Taiwan and Japan, and Lee is at the center of it all. But he had his share of trials thus far. He debuted in the 2006 EBS drama "The Secret Campus" but had to take a year off after a car accident. After his rehabilitation, he landed his first lead role in the SBS high teen drama "Mackerel Run!" but the series ran short. Lee said, "If I didn't have the accident and continued acting I might not have been able to meet 'Jun-pyo.' I shiver at this thought. What I suffered led me to this breakthrough role. I worried about the role because I'm unknown to the public, but of course I was thrilled to be cast." But the title role of the super popular Asian drama series is actually a heavy burden to shoulder. Jun-pyo is the heir to Korea's number one conglomerate group and a typical spoiled and arrogant character. He is hot-tempered and rough, but also has childlike innocence. A polar opposite of his friend Ji-hu (played by Kim Hyeon-jung), Jun-pyo has his heart firmly set on Geum Jan-di (Gu Hye-seon), the daughter of a working class family who runs a dry cleaning store. Women viewers empathize with the rich F4 boys doting on Jan-di. 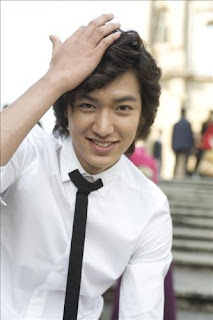 They also get to love Jun-pyo as more of his sides are shown and say he is attractive in many ways. Women want to take care of him and be embraced by him at the same time. He is a high school student in the drama, but Lee is actually on leave from Konkuk Univ. where he majors in cinema/art. What is Lee really like? He said, "I think I'm somewhere between Jun-pyo and Jan-di. I have both sides of them. This cute handsome guy role is unfamiliar though. I can totally carry a pathetic role as well (laugh). But for now, I hope to be Jun-pyo and him alone." The new KBS 2TV drama series airing on Monday and Tuesday entitled "Boys over Flowers" (screenplay Yoon Ji-ryeon, producer Jeon Gi-sang) is off to a good start, stealing the hearts of teenage girls. Ratings pollster TNS Media Korea says the drama's first installment that aired Monday scored 14.3% in viewer ratings while AGB Nielsen Media Research estimated the figure at 13.7%. The previous drama aired at this hour, "The World They Live In" starring top stars Hyeon Bin and Song Hye-gyo, posted 7.7% in its first show and an overall dismal average of 6.1%. By gender and age group, teenage girls were the most avid viewers of "Boys over Flowers" with 19% ratings, believed to be attributable to the cast of handsome young male actors including Kim Hyeon-jung, the heartthrob of the boy band SS501. The comic-based storyline is also engaging. After the first show, some pointed out the awkward acting of a few of the actors and some exaggeration in the story, but most viewers said the drama was better than what they expected. Some 4000 postings were up on the drama's Web site by Tuesday morning, many comparing the Korean version to the original comic. The drama "East of Eden," airing in the same time slot on MBC, posted 27.3% ratings and the SBS wine drama "Terroir" which once surpassed 10% ratings slid to 7.6%. Another drama on KBS 1TV, "Youth Admiration" based on the same-titled literary novel, recorded viewer ratings of 10.8%. KBS to Launch 4 New Dramas in Jan. The epic historical drama “The Iron Empress” is about the granddaughter of Jumong, the founder of the Goguryeo Dynasty, who fought off three Qidan invasions. Noted actress Chae Si-ra plays the magnificent heroine, with Kim Seok-hoon in the role of Kim Chi-yang, the love of her life. “The Splendor of Youth” is a morning drama about the love and dreams of our father’s generation forty years back. This heart-warming show stars Yoo Da-in and Moon Bo-ryeong. “Boys over Flowers” is probably one of the most anticipated dramas of the New Year. Based on the Japanese comic book of the same title, the drama features four of today’s hottest actors. The leading characters are played by Lee Min-ho, Kim Hyun-joong of the idol group SS501, Kim Beom, and Kim Jun. The lucky female character, who gets to hobnob with these four hunky guys, will be played by Koo Hye-sun. The last one on the list is “The Way Home,” a daily drama about a family whose members seek to heal their wounded hearts and find the true meaning of love and family. 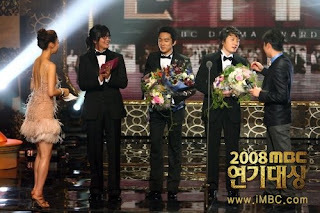 The 2008 MBC Drama Awards were held on December 30th, 2008.